Wintriss Controls Group, Acton, MA, has released its new SmartPac Pro press-automation controller. 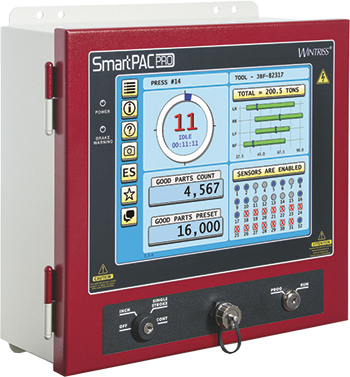 The SmartPac Pro features a vibrant touchscreen interface, dual-core processors, user-configurable dashboards, unlimited tool-setup memory and the ability to share setups among networked SmartPac Pro units. The new control architecture supports advanced connectivity features such as remote access from PCs and mobile devices, e-mail messaging, and compatibility with the Wintriss’ IIoT production-tracking solution, ShopFloorConnect. It also maintains backward compatibility with all legacy SmartPac 1 and 2 modules, including the DiProPac die-protection system, ProCamPac programmable limit switch, WaveFormPac tonnage signature monitor, WPC 2000 Clutch/Brake control and others. In addition, the Wonderware hosting option enables the SmartPac Pro to run independently created third-party HMIs for associated automation, reducing the number of screens required on the press. The control’s new tool-summary screen enables users to view the entire contents of each programmed setup on a single screen, provides a place for users to place notes for each job, and can be exported to a USB disk as comma-separated values. Users can create custom homescreen dashboards to display the information they use most often, name the dashboards and save them in the favorites menu for quick recall.